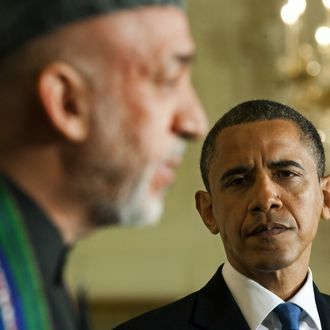 The relationship between President Obama and Afghan President Hamid Karzai has always been rather rocky, but now it’s gotten so bad that Obama is mulling a plan that would have him seeing far less of Karzai in the coming years. U.S. military involvement in Afghanistan is scheduled to wind down by the end of 2014, but there had been talk of leaving behind a “residual force” of a few thousand troops. Now, with the relationship between the two presidents hitting a “new low” in recent weeks, the New York Times reports that Obama is seriously considering a “zero option” that would leave no troops in Afghanistan after next year. There are still 63,000 American troops in Afghanistan, and that number should be down to 34,000 by February 2014. Rather than waiting until the end of 2014 to pull the remaining troops from the country, the Obama administration may bring home most U.S. forces by next summer. Removing all troops from Afghanistan was always a possibility, but the Times reports that it was previously the “worst-case scenario.” A senior Western official in Kabul said he hopes the Karzai government is starting to understand that it’s a strong possibility, and that “they’re learning now, not later, when it’s going to be too late.” The front-page Times article explaining that Obama is seriously fed up with Karzai should help drive the point home.